Bookkeeping for small businesses is a simple guide to help you if you are thinking about starting your own home business. How Important is Bookkeeping for Small Businesses? That's like asking “why do I need to brush my teeth?” Teeth need to be kept clean so they don't go rotten, cause a lot of pain and fall out. Businesses, even sole proprietorships need to maintain an efficient bookkeeping system so that they don't fall apart financially, cause a lot of stress to the owner and go out of business! 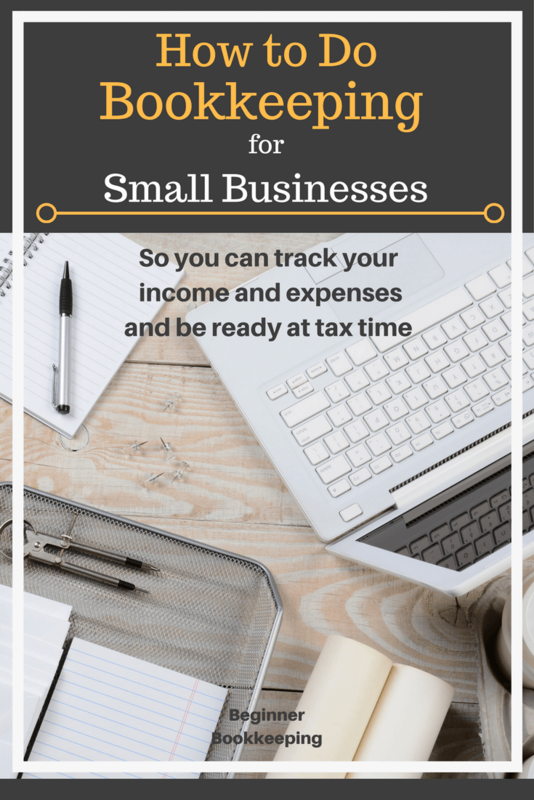 The only way to know how much income and expenses to include in a tax return is to keep a record, even if it's a simple excel bookkeeping spreadsheet. Single Entry Bookkeeping which is your basic spreadsheet as mentioned above, or cash book method. Double Entry Bookkeeping which is a method that utilizes ledgers and entering the value of a business transaction twice to keep a balance. Bookkeeping and accounting software is available for both methods. These range from basic cash book programs, like our Excel Cashbook (a simple spreadsheet to help you track income and expenses) to double-entry systems that include sales and purchase invoicing, inventory control and payroll. OpenOffice (totally free and excellent), Microsoft Excel, Quattro Pro – all very good for spread-sheeting with automated calculation capabilities. Here is a comprehensive comparison of QuickBooks, Sage and Xero. Should the Business Owner Do the Bookkeeping? Answer yes to the following questions and you should have no problem doing the bookkeeping yourself. Do you have a few hours per week/month to focus on this task? Have you got patience to sort through paperwork and keep it in good order? Have you got time and patience to learn a bookkeeping system? Do you want to keep costs down by doing your own bookkeeping? As a self-employed, working from home business owner there is no need to feel alone. There is plenty of help available online from websites such as this one, and no doubt there will be some small business support groups in your community. One good idea is to look up a bookkeeping business in your area that offers consultation services; you could get them to spend a few hours with you helping you set things up initially, and then as time goes by ask them for help when you need it. When your business has grown and you reach the point of needing to pay someone else to do the bookkeeping, this same service provider could well be the one to help you. Many software developers have authorized partners or representatives and there may be one in your region who can consult with you. Otherwise, they will have a support line you can phone for step by step instructions. If you have a LinkedIn profile I recommend joining the Bookkeepers Club where all bookkeepers from any part of the world are welcome to ask questions and get help (a business owner doing their own books will be a bookkeeper). Experienced professional bookkeepers and accountants provide their answers and are always very helpful. Your government tax department will have good advice and resources for self employed people. Have a look at their website. They provide lots of information relating to business start ups and tax and what sort of tax deductions you can make especially if you are working from home. If you have kept a good bookkeeping record throughout the year then completing and filing your tax return should be an easy process. If you don't feel comfortable with filing your own tax return then you can always pass on your neat and complete bookkeeping records to a tax accountant and let them do it for for you. Please contact us if you have specific bookkeeping questions that you can't find an answer to and we will help - you are not alone!